The Fourteen Mindfulness Trainings are the very essence of the Order of Inter-being. They are the torch lighting our path, the boat carrying us, the teacher guiding us. They allow us to touch the nature of Inter-being in everything that is, and to see that our happiness is not separate from the happiness of others. Inter-being is not a theory; it is a reality that can be directly experienced by each of us at any moment. The Fourteen Mindfulness Trainings help us cultivate concentration and insight which free us from fear and the illusion of a separate self. Aware of the suffering created by fanaticism and intolerance, we are determined not to be idolatrous about or bound to any doctrine, theory, or ideology, even Buddhist ones. We are committed to seeing the Buddhist teachings as a guiding means that help us learn to look deeply and develop understanding and compassion. They are not doctrines to fight, kill, or die for. We understand that fanaticism in its many forms is the result is the result of perceiving things in a dualistic or discriminative manner. We will train ourselves to look at everything with openness and the insight of interbeing in order to transform dogmatism and violence in ourselves and the world. Aware of the suffering created by attachment to views and wrong perceptions, we are determined to avoid being narrow-minded and bound to present views. We are committed to learning and practicing nonattachment from views and being open to other’s insights and experiences in order to benefit from the collective wisdom. Insight is revealed through the practice of compassionate listening, deep looking, and letting go of notions rather than through the accumulation of intellectual knowledge. We are aware that the knowledge we presently possess is not changeless, absolute truth. Truth is found in life, and we will observe life within and around us in every moment, ready to learn throughout our lives. Aware of the suffering brought about when we impose our view on others, we are determined not to force others, even our children, by any means whatsoever – such as authority, threat, money, propaganda, or indoctrination – to adopt our views. We are committed to respecting the rights of others to be different, to choose what to believe and how to decide. We will, however, learn to help others let go of and transform narrowness through loving speech and compassionate dialogue. Aware that looking deeply at our own suffering can help us cultivate understanding and compassion, we are determined to come home to ourselves, to recognize, accept, embrace and listen to our own suffering with the energy of mindfulness. We will do our best not to run away from our own suffering or cover it up through consumption but practice conscious breathing and walking to look deeply into the roots of our suffering. We know we can only find the path leading to the transformation of suffering when we understand the roots of suffering. Once we have understood our own suffering, we will be able to understand the suffering of others. 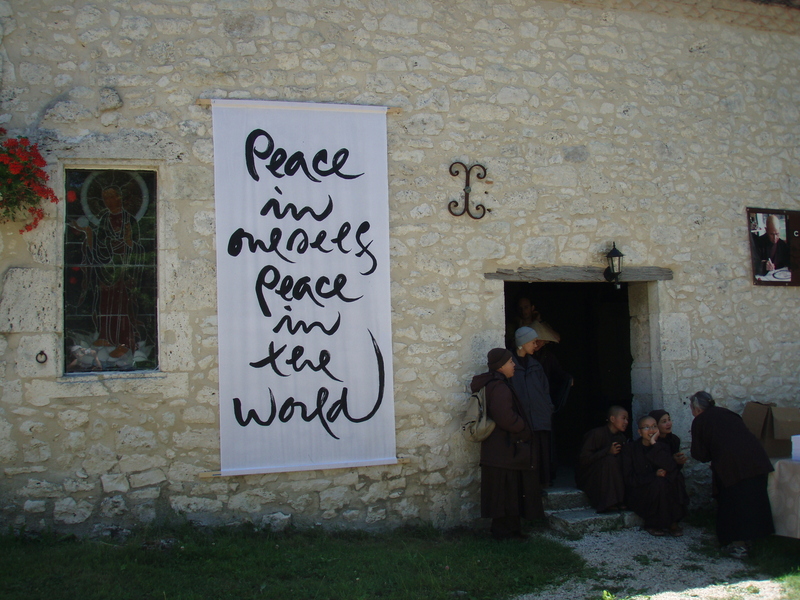 We are committed to finding ways, including personal contact and using the telephone, electronic, audiovisual, and other means to be with those who suffer, so we can help them transform their suffering into compassion, peace and joy. Aware that happiness is rooted in peace, solidity, freedom and compassion, we are determined not to accumulate wealth while millions are hungry and dying nor to take as the aim of our life fame, profit, wealth, or sensual pleasure, which can bring much suffering and despair. We will practice looking deeply into how we nourish our body and mind with edible foods, sense impressions, volition and consciousness. We are committed not to gamble or to use alcohol, drugs or any other products that bring toxins into our own and the collective body and consciousness such as certain websites, electronic games, TV programs, films, magazines, books and conversations. We will consume in a way that preserves compassion, peace, joy, wellbeing in our bodies and consciousness and in the collective body and consciousness of our families, our society, and the earth. Aware that anger blocks communication and creates suffering; we are committed to taking care of our energy of anger when it arises, to recognizing and transforming the seeds of anger that lie deep in our consciousness. When anger manifests, we are determined not to do or say anything, but to practice mindful breathing or mindful walking to acknowledge, embrace, and look deeply into our anger. We know that the roots of anger are not outside of ourselves but can be found in our wrong perceptions and lack of understanding of the suffering in ourselves and the other person. By contemplating impermanence, we will be able to look with the eyes of compassion at ourselves and those we think are the cause of our anger, and to recognize the preciousness of our relationships. We will practice Right Diligence in order to nourish our capacity of understanding, love, joy and inclusiveness, gradually transforming our anger, violence, fear and helping others do the same. Aware that life is available only in the present moment, we are committed to training ourselves to live deeply each moment of daily life. We will try not to lose ourselves in dispersion or be carried away by regrets about the past, worries about the future, or cravings, anger, or jealousy in the present. We will practice mindful breathing to be aware of what is happening in the here and now. We are determined to learn the art of mindful living by touching the wondrous, refreshing, and healing elements that are inside and around us, in all situations. In this way, we will be able to cultivate seeds of joy, peace, love, and understanding in ourselves, thus facilitating the work of transformation and healing in our consciousness. We are aware that happiness depends primarily on our mental attitude and not on external conditions, and that we can live happily in the present moment simply by remembering that we already have more than enough conditions to be happy. Aware that lack of communication always brings separation and suffering, we are committed to training ourselves in the practice of compassionate listening and loving speech. Knowing that true community is rooted in inclusiveness and in the concrete practice of harmony of views, thinking and speech, we will practice to share our understanding and experiences with members in our community in order to arrive at collective insight. We are determined to learn to listen deeply without judging or reacting, and refrain from uttering words that can create discord or cause the community to break. Whenever difficulties arise, we will remain in our Sangha and practice looking deeply into ourselves and others to recognize all the causes and conditions, including our own habit energies, that have brought about the difficulties. We will take responsibility for all the ways we may have contributed to the conflict and keep communication open. We will not behave as a victim but be active in finding ways to reconcile and resolve all conflicts however small. Aware that words can create happiness or suffering, we are committed to learning to speak truthfully, lovingly and constructively. We will only use words that inspire joy, confidence and hope as well as promote reconciliation and peace in ourselves and among people. We will speak and listen in a way that can help ourselves and others to transform suffering and see the way out of difficult situations. We are determined not to say untruthful things for the sake of personal interest or to impress people, nor to utter words that might cause division or hatred. We will protect the joy and harmony of our Sangha by refraining from speaking about the faults of another person in their absence and always ask ourselves whether our perceptions are correct. We will speak only with the intention to understand and help transform the situation. We will not spread rumors nor criticize or condemn things of which we are not sure. We will do our best to speak out about situations of injustice, even when doing so may make difficulties for us or threaten our safety. Aware that the essence and aim of a Sangha is the practice of understanding and compassion, we are determined not to use the Buddhist community for personal power or profit or transform our community into a political instrument. However, as members of a spiritual community, we should take a clear stand against oppression and injustice. We should strive to change the situation, without taking sides in a conflict. We are committed to looking with the eyes of interbeing and learning to see ourselves and others as cells in one Sangha body. As a true cell in the Sangha body, generating mindfulness, concentration and insight to nourish ourselves and the whole community, each of us is at the same time a cell in the Buddha body. We will actively build brotherhood and sisterhood, flow as a river, and practice to develop the three real powers – love, understanding and cutting through afflictions – to realize collective awakening. Aware that great violence and injustice have been done to our environment and society, we are committed not to live with a vocation that is harmful to humans or nature. We will do our best to select a livelihood that contributes to the wellbeing of all species on earth and helps realize our ideal of understanding and compassion. Aware of economic, political and social realities around the world, as well as our interrelationship with ecosystem, we are determined to behave responsibly as consumers and citizens. We will not invest in or purchase from companies that contribute to the depletion of natural resources, harm the earth; and deprive others of the chance to live. Aware that much suffering is caused by war and conflict, we are determined to cultivate nonviolence, compassion and the insight of interbeing in our daily lives and promote peace, education, mindful meditation, and reconciliation within families, communities, ethnic and religious groups, nations, and in the world. We are committed not to kill and not to let others kill. We will not support any act of killing in the world, in our thinking or in our way of life. We will diligently practice deep looking with our Sangha to discover better ways to protect life, prevent war, and build peace. Aware of the suffering caused by exploitation, social injustice, stealing and oppression, we are committed to cultivating generosity in our way of thinking, speaking, and acting. We will learn better ways to work for the well-being of people, animals, plants and minerals and practice generosity by sharing our time, energy, and material resources with those who are in need. We are determined not to steal and not to possess anything that should belong to others. We will respect the property of others, but will try to prevent others from profiting from human suffering or the suffering of other beings. Aware that sexual desire is not love and that sexual relations motivated by craving cannot dissipate the feeling of loneliness but will create more suffering, frustration and isolation, we are determined not to engage in sexual relations without mutual understanding, love, and a deep long-term commitment made known to our family and friends. Seeing that the body and mind are one, we are committed to learning appropriate ways to take care of our sexual energy and to cultivating loving kindness, compassion, joy, and inclusiveness for our own happiness and the happiness of others. We must be aware of future suffering that may be caused by sexual relations. We know that to preserve the happiness of ourselves and others, we must respect the rights and commitments of ourselves and others. We will do everything in our power to protect children from sexual abuse and to protect couples and families from being broken by sexual misconduct. We will treat our bodies with compassion and respect. We are determined to look deeply into the Four Nutriments and learn ways to preserve and channel our vital energies (sexual, breath, spirit) for the realization of our bodhisattva ideal. We will be fully aware of the responsibility of bringing new lives into the world, and will meditate upon their future environment. This is really great to have direct access to via the website. Thank you! !